First, we offer 8 workshops for graduate students and Phd candidates onspecialized topics about mobilizing ethnicity. Each student of the summer school can choose two workshops during the course of the program. The workshops introduce the recent discussions and give methodological orientations in the research of ethnic dynamics in the Americas. Second, we offer for all students of the summer school a media-practical unit. Here the students learn the technical and practical basics to produce a radio documentary. The radio-feature will be produced during the summer school. 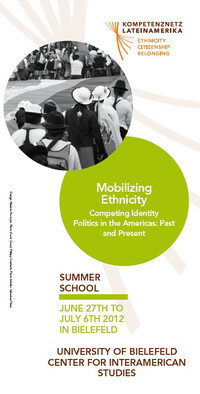 Third, during the summer school, a conference on “Mobilizing Ethnicity” will take place. This conference will unite out-standing scholars to debate the ethnic dynamics in political, cultural and economic fields in the Americas. Please note that the Workshops and the Conference will be held in English and Spanish. Students who want to apply for the Summer School must be fluent in one of these two languages. For students it is also possible to obtain credit points or a certificate. The aim of this workshop is to give an introduction to indigenous media production, which has seen a considerable increase since the 1980s when programs such as the “transferencia de medios” by the Instituto Nacional Indigenista in Mexico or the Bolivian CEFREC started to train indigenous people in the use of film and video. We will have a look into how these forms of self-representation evolved from those early times when there was a notable influence by visual anthropologists to the growing autonomy of media production with the creation of transnational filmmakers’ networks such as the CLACPI, a specialized festival circuit and ultimately internet television. The aim of this workshop is to offer an introduction to the languages of Central America, from Uto-Aztecan and Mayan languages in Mexico, to the Chibchan and Choco languages in Panama. First, we will introduce the languages and the language families and we will discuss the language situation in the present (language communities, influence of the transformation processes in Latin America to the language use, language endangerment). Second, we offer an outline of the linguistic properties of these languages: grammatical categories that are unusual in the perspective of native speakers of Indo-European languages, relation between linguistic categories and properties of the conceptualization. As an illustration, we will present and analyze recorded texts in indigenous languages. This workshop is addressed to anyone interested in the study of Latin American languages and cultures (it does not require any technical or linguistic skills). The workshop is organized in cooperation with Prof. Dr. Juan Diego Quesada. From a comparative perspective, this workshop on ethnic literature will engage with literary works by African American, Asian American and Latin writers in an attempt to grasp the history, complexity and richness of literatures that inevitably exceed, and often precede, the established boundaries of literary canons and nation-states. We will focus on concepts of ethnicity and post-ethnicity in the discussion of selected literary texts. In addition, with reference to the US in particular, we will look at literary texts claiming their right to be acknowledged as integral to the literary tradition of "the" nation of immigrants par excellence, which too often has thwarted the immigrants' desires to belong and enjoy the American Dream of perpetual improvement. This workshop will offer three phases of discussion to encourage thorough analysis of the topic. First, we will dive into the discussion process on migration theory within the framework of social justice and social differentiation. We will then continue to explore, the impact that class, ethnicity, gender and the body plays on migration theory. Next, with a brief brainstorming activity we will develop a research design for investigation and will work with a transcription of a biographical interview. Everybody is invited to bring her/his research material (in Spanish or German) to participate in the social science methodology “Forschungswerkstatt”. Finally, in the third phase of the workshop you are invited to observe “case studies” in migration contexts of Latin Americans by conducting interviews or filming social situations. At the end of the workshop, everyone should be prepared to present their findings. Latin American societies have sought more or less successfully to aim for reconciliation after the massive human rights violations during the years of military dictatorship and the escalation of state sponsored, paramilitary and guerilla violence in the late 20th century. As in other places, truth commissions have been an important political instrument in this process. Following these developments, new attempts to address historical, structural injustices of colonialism and slavery have emerged. But is it possible to judge crimes, that happened centuries ago the same way as present day rights violations, even as the traumatic consequences of racism, ethnocide or land robbery are still felt today? Who are the victims and who are the offenders in these cases? How do groups legitimize claims to reparations, when they have no direct relation to the original crime? These are questions, that are to be addressed in the workshop. We will look into the practical work of recent truth commissions, evaluate the debates regarding historical justice and discuss politics of memory in contemporary Latin America. Urban spaces are highly creative sites in the social and cultural production of ethnic identities. On the one hand, we can state dynamic processes of cultural hybridization due to immigration, cultural diversity, cosmopolitan imageries and liquid life-styles. On the other hand, we can observe a growing importance of cultural heritage and politics of authenticity, that aim to fix identities and cultural disposition vis-à-vis the fear of a homogenizing cultural globalization. Both dynamics go hand in hand with a new strategic use of ethnicity in urban cultural politics that finds its expression in transnational heritage programs, urban tourism, life-style-marketing, and gentrification. The workshop will begin with an introduction on the relevant academic literature on urban cultural politics. Next, this workshop will explore the multi-facetted and conflictive dynamics between heritage and hybridization by analyzing paradigmatic examples of urban ethnic landscapes in the Americas. Since the last decade of the twentieth century ethnic mobilization has provoked major changes in the social, political and cultural outline of most Latin American nation-states. Constitutional reforms, new modes of political representation and participation and concrete measures to protect the cultural diversity of society have been enforced. At the same time, new concepts of society, politics and legal practice legitimated by reference to a peculiar indigenous tradition have provoked fierce disputes and conflicts which, in some cases, threaten to divide society and even, as in Bolivia, menace to lead to complete disintegration. The workshop focuses on these recent trends of ethnicization of the political sphere and addresses the major achievements and obstacles they have produced during the last two decades. Through a participatory approach - basically developing a role play activity and possibly supplementing with a SWOT analysis or working on case studies - an exchange of different views and opinions of the participants around development and development co-operation shall be encouraged. The practical exercise will serve as a means of introduction into the topic and at the same time as an exchange scenario to enrich the debate around ethnicity, identities and development. The workshop is directed to everybody interested in development, especially in Latin America. The workshop language will be Spanish and participation will be limited to 15 people.